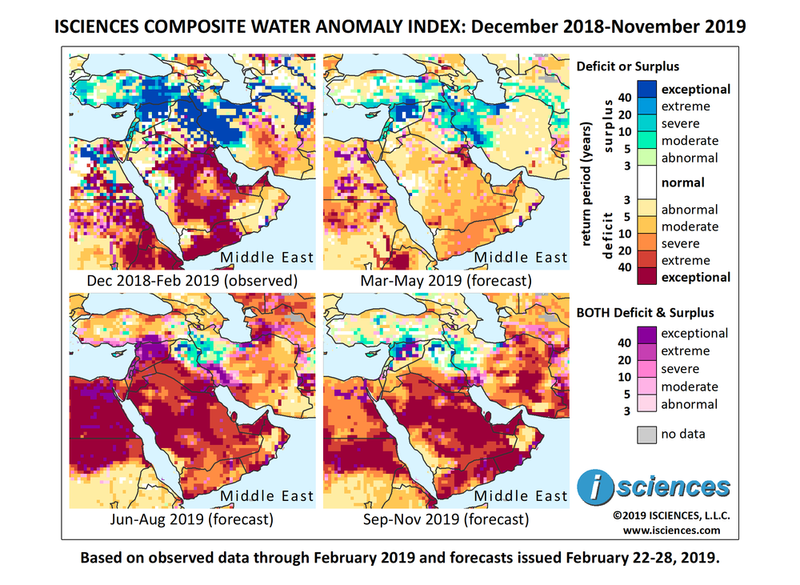 The forecast for the 12-month period ending November 2019 indicates widespread, intense water deficits on the Arabian Peninsula including exceptional deficits in pockets of Saudi Arabia, United Arab Emirates, Yemen, and western Oman. Exceptional deficits are also forecast along the Gulf of Oman. Extreme deficits are forecast in Kuwait and Qatar; moderate to extreme deficits in much of southern Iran and Georgia; and deficits of generally lesser intensity in Jordan, Iraq west of the Euphrates River, and scattered along Turkey’s Black Sea Coast. Surpluses are forecast in Cyprus; from Gaza through West Bank; northern Syria and across the border into Turkey; from the Euphrates River in Iraq into western Iran; and along Iran’s central Caspian Sea coast. Surpluses will be exceptional in Syria; around Mosul and Kirkuk, Iraq; and Lorestan, eastern Khuzestan, and Mazandaran, Iran. The forecast through May indicates that deficits in the region will downgrade considerably, though an intense pocket will persist around Kuwait. Severe deficits are forecast for Yemen, and moderate to severe deficits in Saudi Arabia and United Arab Emirates. Surpluses will downgrade as well from the intensity of the prior three-month period. However, exceptional surpluses are forecast for northern Syria; near Mosul, Iraq; along Iran’s Caspian Sea coast northeast of Tehran; and in Khuzestan, Iran. Surpluses of lesser intensity are forecast along the eastern Mediterranean coast; pockets of Turkey and along the Murat River in the northeast; and from eastern Iraq through western Iran. From June through August deficits will intensify significantly on the Arabian Peninsula and will emerge in the Levant, with conditions of both deficit and surplus (purple) as transitions occur. Deficits will be extreme to exceptional and the affected area will include Iraq west of the Euphrates. Surpluses will shrink in the region, but surpluses are forecast in northeastern Iraq and into northwestern Iran through Hamadan Province. Surpluses will nearly disappear in Turkey as deficits of varying severity emerge. Deficits will emerge in much of Iran’s eastern bulk and will be extreme near the Persian Gulf. In the final quarter – September through November – deficits will downgrade in the Levant, surpluses will re-emerge in northern Syrian and pockets of Turkey, but extreme to exceptional deficits are forecast for the Arabian Peninsula and many areas in Iran’s eastern bulk. Iran’s Supreme National Security Council has banned publication of news reports about water shortages and resource misuse, according to an apparently inadvertent slip by a member of the Iranian Parliament who noted that officials in Isfahan Province ignore such government directives. Protests have erupted in Isfahan and nearby towns during the last year against water allocation policies that contributed to the drying of the province’s main river, leaving tens of thousands of farmers with inadequate water supply. Flooding from heavy rains in early February cut off two main roads in the southern Arava desert in Israel and forced the closure of Ein Gedi National Park. Saudi Arabia experienced the worst of the February flash flooding as it ravaged west and northwest regions, killing 12 people and injuring hundreds of others. In early March flash flooding following heavy rain in southeastern Iran killed at least two people, and flooding later in the month ravaged parts of Iran, Iraq, and northern Syria. The floods blocked a border crossing in the Kurdish regions of Iraq and Syria that has been critical for international journalists entering Syria and for Syrian Kurds’ access to the outside world. At least 19 people were killed in Iran alone in flooding that was called “unprecedented.” Hundreds of people were rescued and 150 vehicles were pulled out of floodwaters in Shiraz. Agricultural losses in the northern province of Golestan are estimated at USD $260 million.